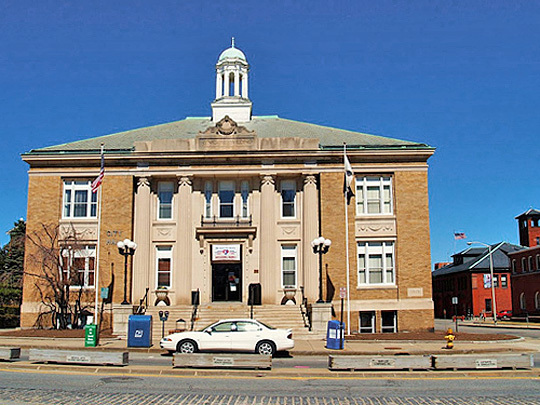 Photo: Leominster City Hall, photographed by Marc N. Belanger, 2006, en.wikipedia.org, accessed February, 2011. Originally part of the Town of Lancaster, Leominster was first settled about 1653, incorporated as a town 1714 and incorporated as a city in 1915. Leominster grew as a manufacturing town. Combs were made as early as 1770, and by 1845 there were 24 factories producing them. The du Pont Viscoloid Company developed viscoloid as a substitute for the horn originally used for combs, and in doing so became the most important industry in the town. At one time over 75 percent of the nation's piano-cases were made here, but the activity had ceased by 1935. In the 1930s plants in Leominster turned out such diverse products as furniture, toys, combs, buttons, worsted dress fabrics, wool yarn, dress ornaments, paper and paper boxes. The library has a number of books that were printed in Leominster between 1796 and 1813.